We have our first listener question about the word ornery, which apparently has both regional variances in terms of pronunciation and definition. 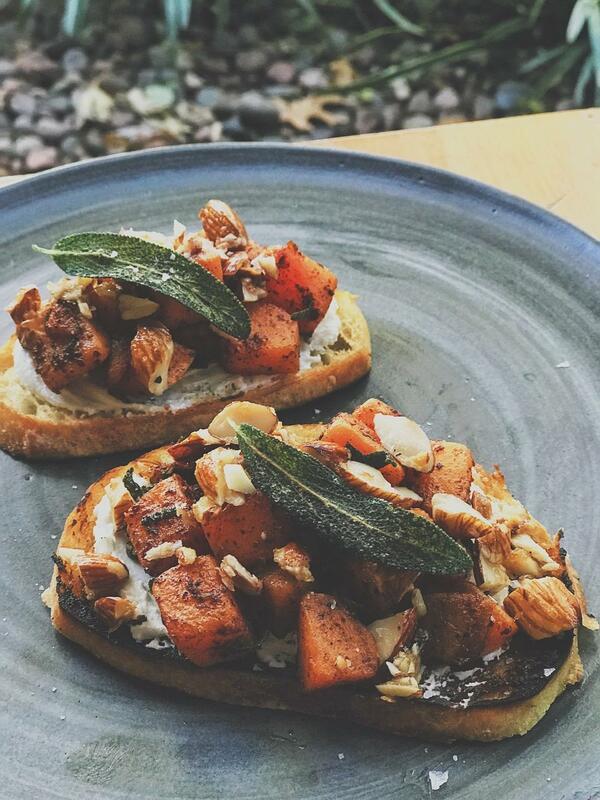 And since we're talking about food, special in-studio guest Lela Meadow-Conner (aka @toastchick) has a couple of bruschetta recipe ideas for us. Most important ingredients: Good olive oil, garlic and flake sea salt for finishing. For bruschetta: Take a crusty bread of your choice and slice to the thickness of your liking. For just a few, toast in oven, cast iron skillet or grill, with a drizzle of olive oil. For multiple toast, slice, place on baking sheet, drizzle with olive oil and bake or broil until crisp. Once bread is browned to your liking, take a smashed garlic clove and rub directly on to one surface. Cook the sausage in skillet until brown. Remove from pan, leaving any drippings. Add 1-2 tablespoons olive oil in a skillet on medium high heat and add butternut squash. Toss with salt and spices, coating well. Cook up to 10 minutes (depending on sized of your squash cubes), tossing frequently to get caramelization. Add the juice of 1/2 lemon to deglaze the pan (add more spice as needed.) Reduce heat to low and add a pat of butter to finish. Chop 6 sage leaves and add to the skillet. Toss lightly. Remove from heat. To candy the nuts (use almonds, pecans, walnuts, cashews, etc.) add the butter and brown sugar to the pan and melt. Chop nuts and add to pan, tossing them well in the mixture. Remove from heat and place evenly on a sheet of wax paper to cool. 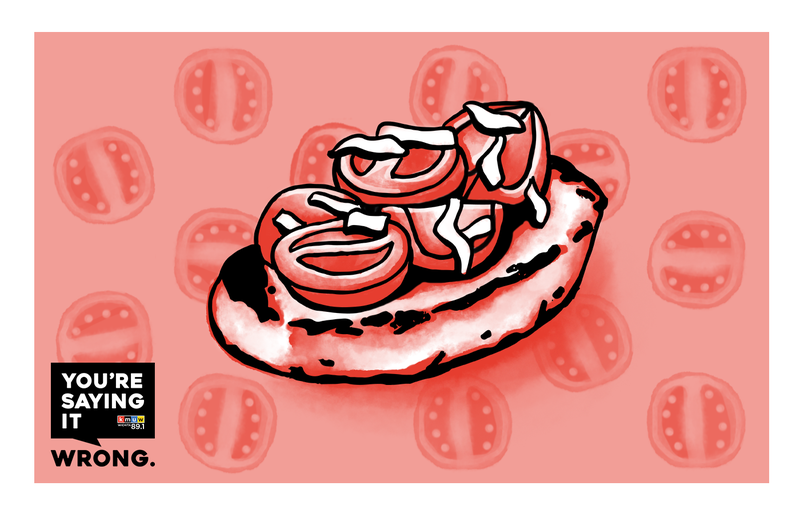 *For vegetarian version, skip the sausage. For vegan version, skip sausage and try Kite Hill Almond “Cream Cheese.” For gluten free, try Little Northern Bakehouse or Canyon Gluten Free breads and slice into triangles or squares. 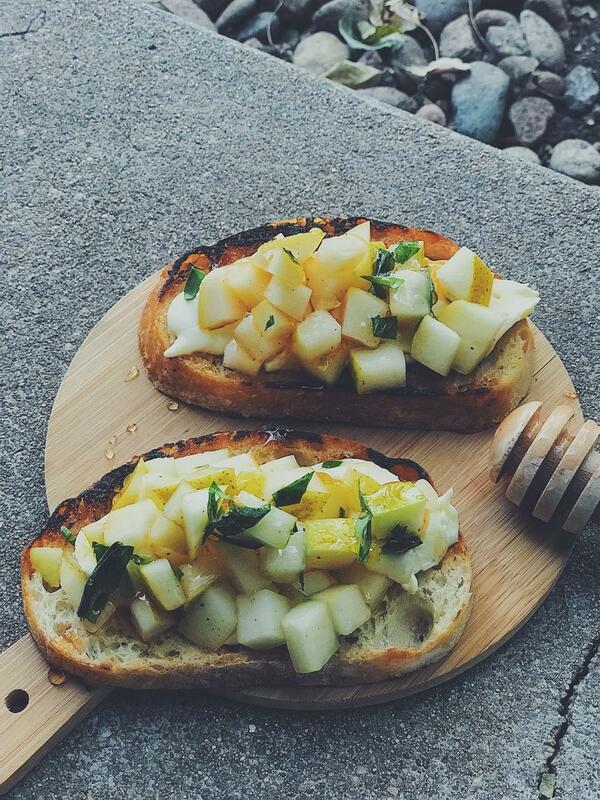 Chop the pears into small cubes (as if you were chopping tomatoes for traditional bruschetta.) Add to bowl and toss in olive oil. Add the juice of 1/2 lemon. Add two to three turns of fresh cracked pepper and 2 tablespoons fresh tarragon. Toss lightly. Mix honey and sriracha together in small bowl. To assemble bruschetta: Top toast with a long slice of brie (slice cheese long-wise) and add a 1-2 tablespoons of pear mixture on top. Drizzle with spicy honey and finish with fresh tarragon leaves (chopped or whole) and a sprinkle of seat salt. *For vegan version try Kite Hill Almond “Cream Cheese” and use honey substitute like agave nectar. For gluten Free, try Little Northern Bakehouse or Canyon Gluten Free breads and slice into triangles or squares. Find more of Lela Meadow-Conner's toast creations on her Instagram page: @toastchick.